Soak the raisins in warm water and keep it aside. Heat oil in a pan on medium heat and add the Panch Phoran and dried Red Chillies and fry for about a min. Add the pineapple pieces and mix well into the spices. Cook for 10 mins. Now add the Turmeric, Salt, Sugar, Chilli Powder, ginger, raisins, vinegar and half a cup of water.Cook for about 30 mins till the pineapple pieces become soft. While the chutney is cooking, heat a skillet or pan over medium heat and dry roast all the spices for the tempering. Roast for about 2 mins till the spices become fragrant and turn a shade darker. Constantly stir, so that the spices do not get burnt. Grind the spices into a powder. Just a big spoon or ladle, mash up some of the pineapple pieces to give the chutney a thicker consistency. Switch of the heat and let it cool for a while. Then add the powdered spices and mix well. Store the cooled chutney into air tight jar in the fridge. It can be easily stored for 2-3 weeks. This entry was posted in Pickles & Chutneys and tagged Anannaas Chutney, Pineapple Chutney by Kamakshi. Bookmark the permalink. Love it! Def am going to try it! Made three batches of this recipe with slight modifications. Reduced chilli powder from 1 tablespoon to 1 teaspoon and put the cinnamon stick in at the beginning. Recipe still turned out Very hot. 2 whole chillies in subsequent batches resulted in a medium hot chutney. 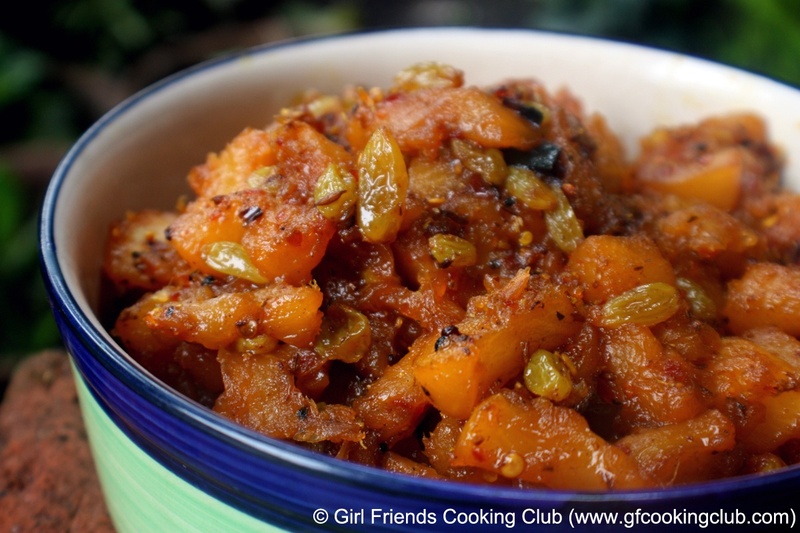 Delicious, fruity, nicely spiced chutney. Processed jarred chutney 10 minutes in boiling water bath. I am so glad to know that you tried this recipe and adjusted it to your taste … There is no hard and fast rules for cooking, I believe you should try what works out best for you … Happy Cooking !